The Micro OWL 2 is one of the world’s smallest optical power meters to offer so many features, including a 0.15 dB accuracy over its normal operating range. It is as feature-packed and accurate as optical power meters costing hundreds of dollars more. This combination of features, size, accuracy, and price make it a tremendous value for the optical fiber professional. 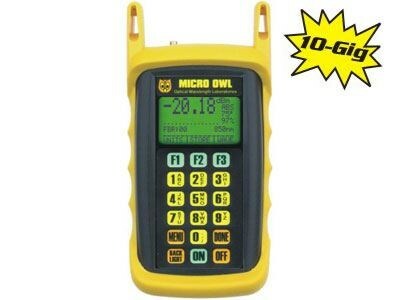 The Micro OWL 2 is a high accuracy, high resolution, microprocessor controlled, optical power meter. It has an small handheld case made from high impact plastic, a backlit, graphic, liquid crystal display, and 18-key keypad for easy data entry. It can be ordered with an integrated visual fault locator (in the place of the battery charger). The meter will operate for over 100 hours on a standard 9v battery and has built-in automatic shutdown. The Micro OWL 2 includes a built-in Fiber Loss Wizard that helps you easily calculate the allowable loss for the fiber runs that you will be measuring. The meter stores physical fiber characteristics for eight different locations, or links. This includes: link name, date, fiber type, fiber length, connectors, splices, temperature, and calculated or entered reference power values for three wavelengths. In addition the meter will store up to 1000 measured data points with labels. Each value includes the fiber type and link. The stored information can be selectively viewed, edited (measured again), printed, or deleted. The meter will print formatted reports of selected stored data directly using the built in USB port, or all of the stored data can be downloaded to our free OWL Reporter™ data management and reporting software.